These are written as if Cobra and Isis were speaking, although these are not what they said word by word, but paraphrasing what they said. Cobra has read these notes and confirmed them. The increasing influx of Goddess energy will change everything, so it will change also our ways of communicating with each other. Within communication, words themselves as "information packets" make up only 7 % of the complete communication. This means, the other 93% is made of body language and energetic intent. Most people do not realize this and only listen to the words and they get confused through the feelings they have sometimes, even though nothing bad was said. In truth, it is just the perception of the 93% of the communicated information codes, that triggers strange reactions while resonating with their own programming. In the future we will use more of our telepathic and intuitive abilities and communicate in more complete ways. In this process it is helpful to activate the connection with our own soul. This connection can be deepened by asking ourselves : What touches me, what makes me happy, what is it, that makes my heart sing ? This is the direction, where my soul wants to guide me, this is what inspires me to live for. This is the first step: to get to know ourselves, who we truly are. When we will expand our being into our true soul presence, our way to communicate will also be more in alignment with our divine being and therefore attract this frequency as well, which means : happier communications. We are programmed within our unconsciousness (view part 1 of the notes), we all look through sunglasses, made of different colors, into the world. Often we are not conscious about the fact that others think, feel and communicate differently than we do. When we express ourselves and we have not reached enough consciousness about ourselves and others, many problems arise within our communications and sometimes we think we are left alone and nobody understands us. Now we are taking responsibility back again. Beautiful times are dawning and we will grow TOGETHER by allowing the change to happen. We support each other during this transition through true heart compassion and allowance of change. We also are willing to be witnesses of changes that we have been able to make. And we allow ourselves to honor the changes others have accomplished. We honor these achievements and allow the old pictures about ourselves and others to go. Even though communication is so important, there has not been enough conscious focus on it yet. Instead, communication is “taught” only unconsciously through the behavior of our parents, teachers etc. All this programming created many penetrator-victim situations. Feelings of not being good enough, competition and negative behaviors have been created and supported. Within the new energies there will only be win-win-situations. The new ways of communication will show up in all areas of life, so for example also in trading : the quality will be more important then the gain of money. Deep respect, honesty and truthfulness will be present. Excuses are also really important in the new world, but they have to be honest. The throat chakra is important for the communication, yet the other chakras also have to work fully to have the complete flow of energy. 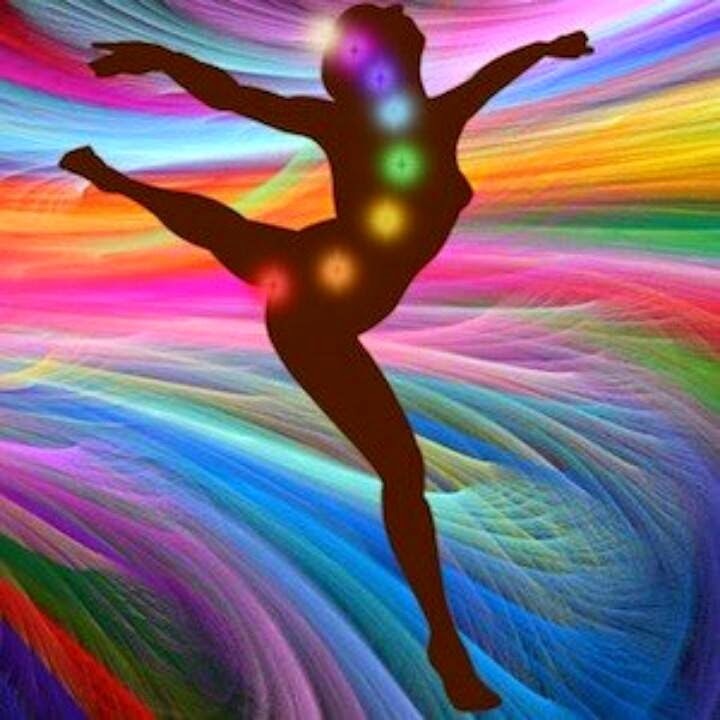 So working with the chakras is very helpful in any case and there are many tools available, especially working with Goddess energy is very powerful. The old patterning is created in such a way that we only listen to the spoken words, and while we are listening we already think about our answer. Everybody understands different things when they hear the words "love", "consciousness", "will" for example. This will change into a more complete listening with our full being. When we find ourselves in silence we become able to listen with our full presence, to all aspects of the other being, and we then can feel the presence of the other within our being. This is the first step to let the Goddess energy flow in our life : surrender to the Goddess starts with listening. We relax into the present moment and the answer comes spontaneously. This is how we take responsibility for our new art of communicating. Honesty, respect, empathy, receptivity and to show our feelings : this are properties of true feminine power. This is how the divine feminine can be expressed and perceived. In the coming times it is of utmost importance that we express, along with our feelings, our talents in joy and happiness also. Look inside, what inspires you the most, find out, what is it, that would make you stand up in the middle of the night to do it right in that moment. If you find this, you will have found true passion and this leads you to your true path. Use all those tools and create your way like that. Sometimes it is more useful to connect with like-minded people than to search for answers in books and seminars. Being together with others who have the same interests, multiplies your own joy and you will find how to express yourself in joy. True joy and interest will also trigger so much respect, that you easily respect your own boundaries and the boundaries of your loved ones. As soon as you are in true power you are full of respect for yourself and others, and so you do not get confused if others says "no". You will just be present in the heart, centered within, with deep roots down into mother earth and wings up into the sky. Through the Sisterhood of the Rose, Goddess Energy comes back to Earth. It is the real consciousness of oneness without competition, without comparing yourself with any other living being. It is part of the the soul presence within the matter. This is all about unconditional love, respect, understanding. We are all facets of one single, beautiful, shining diamond. The aspects of the Goddess like Isis, Hathor, Sekhmet, Bastet are all different expressions of the One. This understanding now comes back to earth. It helps men and women to awaken and to regain their true power and to get alive again. For the men it is a wake-up call to no longer suppress their feelings and to express them without fear of being ridiculed. For the woman it means they can now be in their truth without getting too masculine, they can be soft and powerful at the same time. The divine child is a symbol for the completely balanced energies of masculine and feminine. So, Horus is a symbol for that, the symbolic child of Isis and Osiris/Ashtar. As a divine child of the Goddess, it is helpful for us to feel the presence of the divine child within us, it creates balance within ourselves and it allows the Goddess energy to flow through us. Through our connection with the Goddess we find our balance, spiritually, emotionally and physically. New preferences and new consciousness arise. Giving and receiving, action and reception are balanced. In ancient times in Egypt, men and women were intiated into the mysteries of the Goddess. They learned how to use certain symbols, tools and knowledge to bring the Goddess energy to the planet. The high priestesses also knew how to use sound in its full impact. Yet, the first mystery of the Goddess is indeed : silence. Silence it is the doorway to reception and this leads to surrender. And surrender allows Goddess and God energy to be fully present within your physical body. It is the expression of the spirit in matter, allowing the soul to inhabit life completely. The soul purpose serves the highest good of all that is, all of creation. Every deed is a ceremony to celebrate life. Through the Goddess presence we learn how to lead naturally, letting the divine energy flow through us. The knowledge about all those things is what the high priestesses taught in Egypt and this is as well what will be here again in the new society. A very important symbol within this context is the pentagram. The pentagram balances the five elements fire, earth, air, water and ether. It is a magical number and life is only possible by the merging of those 5 elements. We are small micro-cosmoses that include the five elements. The Fibonacci spiral and the order of sacred geometry show themselves already in every embryo, in a shell, in stones in the DNA. The new society will handle the five elements consciously. The holy symbols are cosmic energies in manifestation. The Milky Way with the galactic center is a double spiral with a divine pattern, the ocean of love emanating from it. The central race is the first advanced civilization who gained high wisdom in this galaxy millions of years ago, as they live near the central sun. Those beings brought their wisdom into the whole galaxy. They were known as ambassadors, angelos in greek, messengers, angels... They are not only etheric beings, they are physical angels with wings also. Iona is the winged Goddess who brought the mysteries to earth in the times of Atlantis. 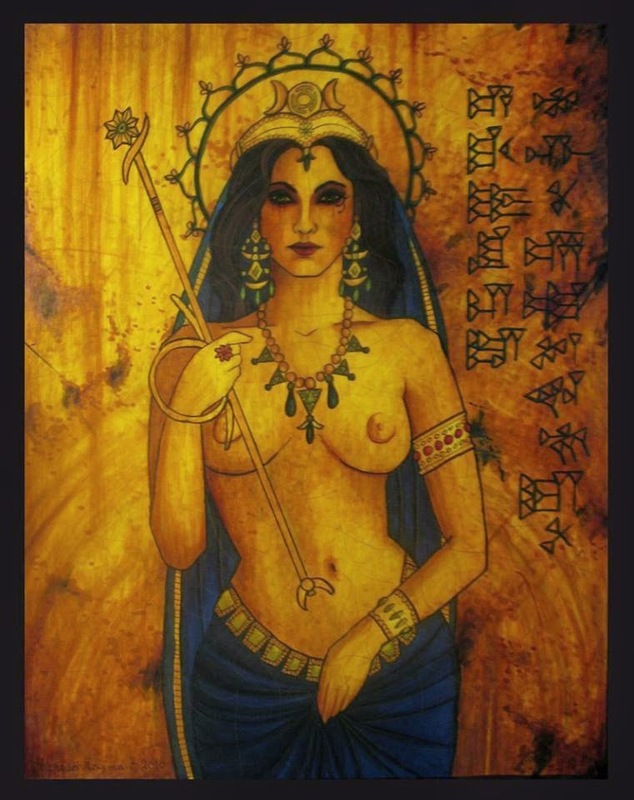 Isis/Astara was her student. When Iona left earth she gave the mission to Isis to keep the knowledge of the Goddess alive. Isis founded the mystery schools in Atlantis and they had to go underground when the downfall of Atlantis happened. The main place of the mystery schools of Earth was in Egypt. This area was bigger than we perceive it today, it included also many islands of the mediterranean ocean. On Malta was the main temple which always had been a light pillar. According to the legends, the temples were build by giants. This was the beginning of the Sisterhood of the Rose many thousands of years ago in Egypt. The Sisterhood of the Rose were composed of enlightened beings of high advanced wisdom and abilities who were living and celebrating sacredly in the temples. So they were very very powerful and the Archons of course did not like that. The Archons destroyed the temples and the knowledge of the Sisterhood was hidden underground. The Archons sent messengers to pray to their God called Aton. They forbade the mystery schools which then went under the surface as Isis temples. The priesthood nevertheless was very strong and because of this they reemerged after a short time and the temples were active in the mediterranean area again. During the times of the roman empire, temples of the Sisterhood of the Rose spread all over the empire, like for example Avalon in Ireland. The knowledge of the Sisterhood of the Rose was handled extremely secretly and only initiates knew what happened in the temples. They swore to never ever tell the mysteries to anyone outside of the Sisterhood. The mysteries of the goddess are highly sacred. They are not meant for beings who are not ready to receive them. If they would be told to the masses, they would be distorted and misused. So the deeper mysteries of the Goddess are only told to initiates. Even most of the most awakened beings on this planet are not ready yet to receive the full spectrum of the mysteries of the Goddess. The programming is deeper than even most of the light workers are aware of. With time, and only after the Event, the complete mysteries will be released exclusively to those who are ready to receive them. The name of a simple mystery of the Goddess can be released already now : The mystery of the immortality of the soul. In roman times again, the Archons tried to destroy the mysteries. In the 4th century Konstantin the Great wanted to create one synthetic religion made of all religions. Bishops all over the empire were commanded to gather to the well-known Council of Nicaea. There, all bishops had to sign the document or they would not have left that room alive, the "guardians" would have taken care of that. The decree of Nicaea is the basis of the catholic religion which was and is still used to serve as a special tool for controlling the masses. Since that day, everything else was forbidden inside the roman empire. The mysteries of the Goddess did not exist in a written form. The temples were destroyed and the priestesses and priests were killed. Later, the re-incarnated members of the Sisterhood of the Rose worked from underground, they spread the knowledge by working indirectly by using symbols for example in architecture, paintings and music. The cathedral of Chartres is one of the buildings where many of those symbols can be found. The Holy Grail is one of the symbols and it has gained its faim through being included into buildings and poetry. Another symbol is the chalice of the Goddess formed like a rose, so the rose as well is a symbol related to the mysteries of the Goddess, imbedded within poetry and art. There exists a secret book, called "The Red Book", and the catholic church could never get it. It was given from mother to daughter, on and on. The Sisterhood of the Rose influenced many times the happenings in the political world from behind the scenes, as was the case with Hitler, when the Sisterhood contacted Eva Braun. So, some even worst scenarios could be prevented. At the court of Saladin, many battles have been hindered from happening and often peace was made through the influence of the Sisterhood of the Rose. A new army was sent to Richard Löwenherz when he was heavily wounded, a completely illogical maneuver in history. The Sisterhood of the Rose has prevented the atomic war on earth. The Goddess wants peace and peace will be. At the Event, the members of the Sisterhood of the Rose will anchor the energies of silence and peace. The masses will not understand what is happening, so there will be some kind of agitation, and the Sisterhood of the Rose will calm all this down through their meditations. This means, they have a key role at the Event. Even though many do not realize yet the whole meaning of that, it is important to build the groups now, so that during the Event all will be calm and peaceful. In the moment it seems likely that most of the same people who are forming Sisterhood of the Rose groups are also gathering for the masculine aspect of the Event, the Event Support groups. This is often the case, as the others are not enough awakened yet. In any case, it is good, to find your own role within this whole process and to follow your inner guidance -as always. The pentagram is also a symbol for the Goddess and the circle around the pentagram means protection. The energy of the Goddess is extremely soft and the same time very very powerful. It is the energy of creation. Throughout history, the dark forces tried many times to suppress that energy. Strong women, healers and "witches" have been indeed high priestesses. Through the Sisterhood of the Rose, men and women can take back their life energy and life power which has been suppressed in the past. An important thing in the universe is free will. Free will means to express unconditional love of The Goddess and the God freely. Our knowledge about the Goddess enables us to gain access to our free will. There is no will that is above our free will : the original blueprint. Our free will is above everything, it is respected on the highest levels. The religious systems are afraid of the strong feminine will, and many times women did not surrender to religion. Through wisdom, spirit comes into matter. If free will is in harmony with the divine, the free will of someone else will never be restricted and everything happens for the well-being of the whole. This is how we are meant to live originally. Now as we are bringing balance back again, it is very important for us to learn how to express ourselves without activating competition and comparison patterns. We can start with this by stopping to compare ourselves to ANY-one. The old system that has its main basis on competition programming -which serves to suppress Goddess energy- will not work much longer anymore. Especially women have now arrived to enter the process of supporting each other instead of competing and fighting. This is really very significant : to truly learn as women to support other women. This is the absolute basis for the re-emergence of the Sisterhood of the Rose, because a circle of women, supporting each other, is the main basis structure of the initiates within the priestesshood of Isis. The divine, the Goddess has many facets and it can not be expressed through only one women, so there are many facets possible to express Goddess energy in varying ways and colors and together they are building one Goddess diamond. This is the start to anchor the divine into matter. The Goddess energy is nurturing itself through itself, and it is absolutely magnetic. 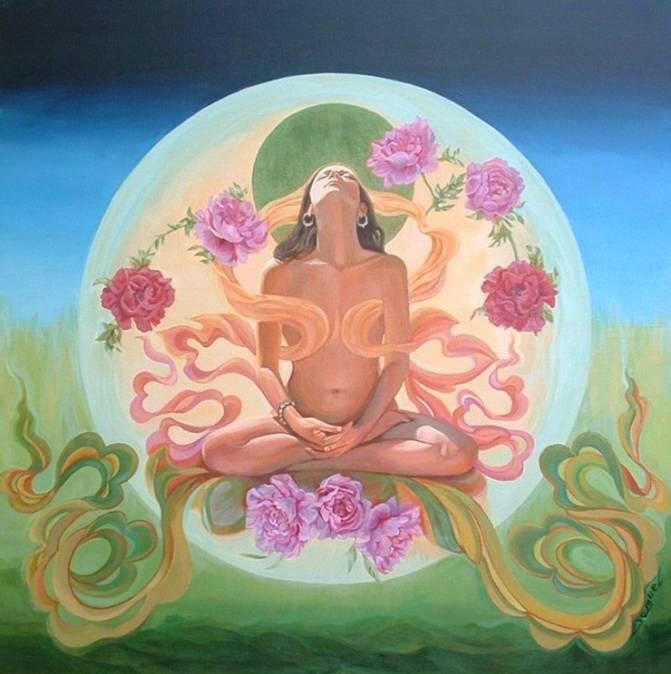 A woman who is in the Goddess energy does not need to fight or to gain attention, as she will be a magnet through her very being, through BE-ing herself. The masculine energy is electric, so the two energies are attracting each other all the time without doing or adding anything to it. 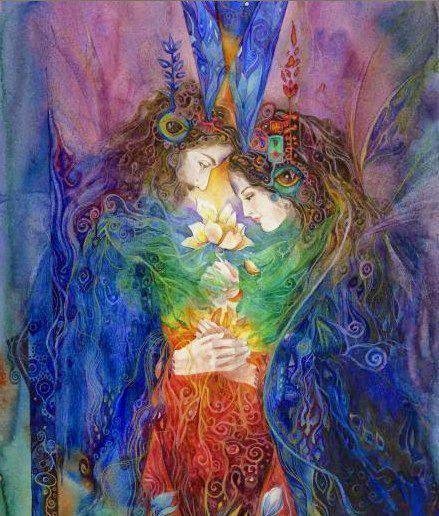 This is creation, divine feminine and divine masculine, attracting each other by their basic construction. The more we find ourselves within ourselves, the more the two energies become present in their original way and this means we are magnetic and electric at once. This again is the power of the lioness/lion in us. The Egyptian Sphinx has a lion body and a women head as a symbol for that lioness power within humans. Women and men who are filled with balanced energies are bearers of that lion energy. Many Goddesses have an animal at their side, which expresses a certain power or ability. One of the symbol animals of Isis is the dove. Teachings about the Ankh, the key of life, the breath of life, were described in Atlantis/Egypt as a symbol for the potential of creation. The Ankh looks also like an angel, a human being, a key [Note from Untwine : It also symbolizes a Yoni and a Lingam, click here for more information]- It can also be seen as the infinity symbol being laid twice over each other with open ends - the "feet" and the "arms" being the open infinity symbol twice- which means to bring something into life (which arrives through the loop) from eternity. Isis gave life back to Osiris through letting her breath flowing through the Ankh. The Ankh can also be held above the head to connect with the higher self or as a lens to "see" into spiritual realms. Slowly we learn again how to use our symbols with deep respect and honor for all of creation. The Ankh is the key to take responsibility within the Sisterhood of the Rose groups and also to bring our soul energy into our body. One of the deepest mysteries of Isis is to bring spirit into matter with the Ankh. In the moment, the strong light energy is removing everything which is synthetic, everything that is non-alive. So the dark forces are suppressing Goddess energy, because they know, they will be removed by her, as they are not filled with divine energy. Now much support is flowing from the Galactic Confederation and from the central sun to us. The central sun is a giant Goddess and as we can see, it moves in spirals. So this means that Goddess energy and Goddess consciousness is spiraling. Goddess consciousness and Goddess power is spiral consciousness. 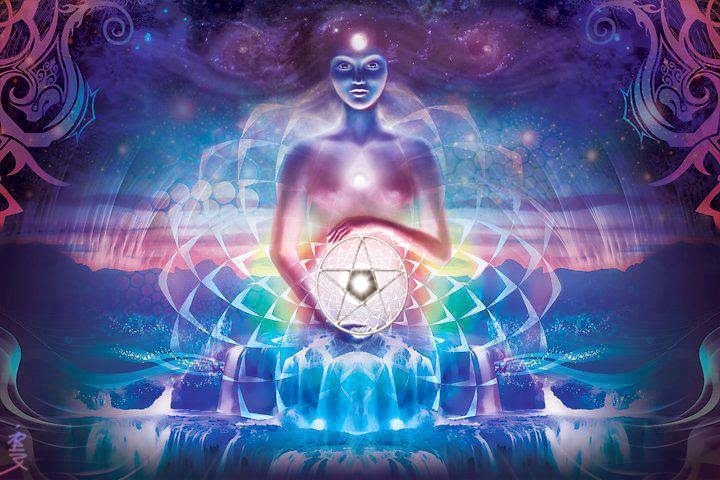 As we now come to understand the spiral consciousness we also understand that we are the ones who have to activate, to allow the spiral consciousness to flow through us, manifest itself through us so that we are the channels for the Goddess energy. Isis and Osiris are archetypes of the energy of balance. The legend about them includes that their love for each other was so strong that it succeeded over all obstacles. The power of creation is the energy of the divine mother. The mother gives birth to life through surrendering to the flow of nature. During a birth resistance creates more pain. We are educated and programmed to be resistant to that energy. As we learn to surrender to the Goddess energy, birth in all areas of life gets more joyful and easier. In the mysteries of Isis, milk is the divine drink through which the divine child receives its life. The crown of Hathor with the horns, embracing the sun, symbolizes that very beautifully. The cow with the horns is a holy animal that gives the divine drink, the milk. It is magic, a mystery of nature. Within the feminine body everything is present to give and to maintain and nurture life - within the womb and also afterwards through the breasts. The same with the animals and nature, life comes out of the seed and in the seed everything that wants to enfold is already present. We find the number 5 again within the fingers and toes and the in the 5 elements. The conference we have held now happened during the equinox, a point in time of balance of the energies. It is the birth of the new life. Everything on the planet is getting back into balance now. This rhythm is the heartbeat of the universe, pressure and relaxation. The earth moves together with the universe in the same rhythm, like a wave in the ocean, like ebb and flow. So is the energy of Goddess and God, a balance of dynamic and spontaneity. tres bien ! ..." to activate the connection with our own soul, by asking ourselves : What touches me, what makes me happy, what is it, that makes my heart sing ?" So beautiful to be reminded of this. thank you Cobra, Antares, Inana! Just Great!! !Thank you Cobra, Antares, Inana! Once again, a truly exceptional rendering of the crucially important points made by a magnificent mind.